Crépes are just thin pancake wraps that you can either have it plain , drizzle with honey or pack it with your favourites - bacon, ham and cheese if you like something savoury or if you like have a sweet tooth , you can pack it with lots of fresh fruits of your choice and with a scoop of homemade ice cream...yumyumyummy. I rummaged for cheddar cheese and bacon chips....I remembered there were some left in the fridge. So at 10.30pm I started preparing the batter and let it rest for 30 minutes. Whip out my long forgotten crepe pan, buttered it and tada...within half an hour I got him his plate of yummy and aromatic C for supper ! Added some strawberries for him just as an eye watch incase he doesn't like the crépes . You make a guess ...do you think he liked his supper last night ? The photos above are for drooling !!! 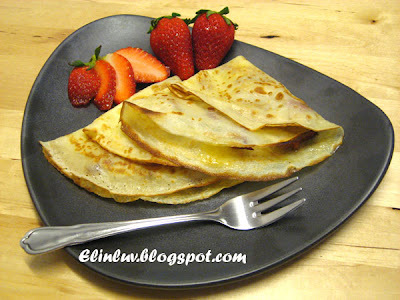 To make the Crépes : Blend milk, flour, cream, eggs, sugar and salt in a blender until smooth. Transfer the butter to a medium bowl and set aside for 30 minutes. Preheat the oven to 200º F .
Heat a heavy 8" non-stick saute pan over medium -low heat. Dab some of the butter on a paper towel and wipe the pan with it. Pour 3 tbsp of the batter into the center of pan and swirl to coat the bottom thinly. Cook until the edge of the crépes is light brown, about 1 1/2 minutes. 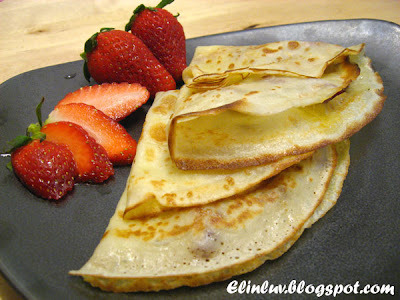 Loosen the edges gently with a spatula and carefully turn the crépes over. 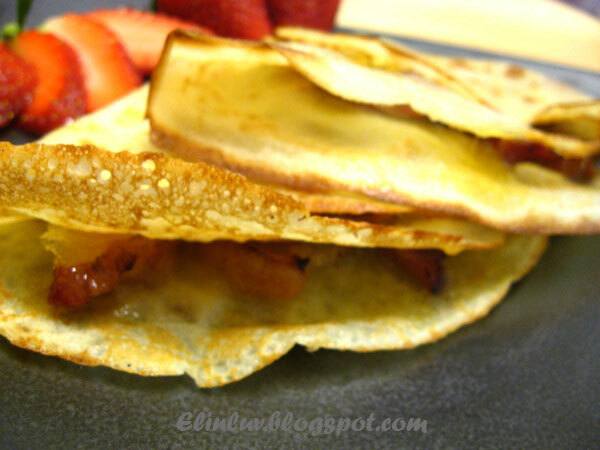 Sprinkle some grated cheddar and the bacon chips over half of the crépes. Cook until the bottom begins to brown in spots and the cheese melts, about 1 minute. 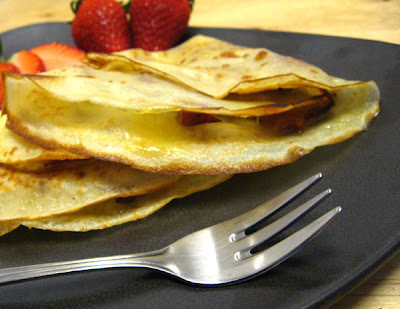 Fold the uncovered side of the crépes over the filling. Transfer to a baking sheet and tent with foil. Place in the oven to keep warm while you make the remaining crépes. Repeat the process with remaining batter and fillings. Wipe the pan with butter as needed. Makes 8 crépes in total. 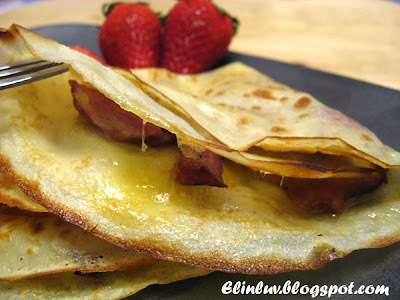 I love savoury crepes, not to mention it's cheesy too! Wish I could have this made for me for breakfast tmrw! Looks very thin and crispy. I like it. 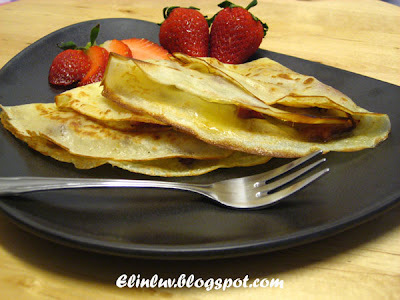 The crepes look wonderful...light and crispy! Those crepes look so nice, thin and crispy. Think it'll be nice too, plain with some kaya instead of savoury. Like that plate, you got it from KL? Yum! Everything is so much better with bacon :)This looks really good.If you won't mind, I'd really love to guide foodista readers to your site. Just add your choice of Foodista widget at the end of this blog post and you're all set. Thanks! Mary...:) yup it is thin and crispy at the edge. I love your pics and ideas!! !